MaraNatha Dark Chocolate Peanut Spread, stirred up a bit. Continuing an oft-revisited theme here at NEAROF!, I fell victim to the inescapable draw of a grocery store end-unit display. The Look: A cute little glass jar with a metal lid. Pretty design. 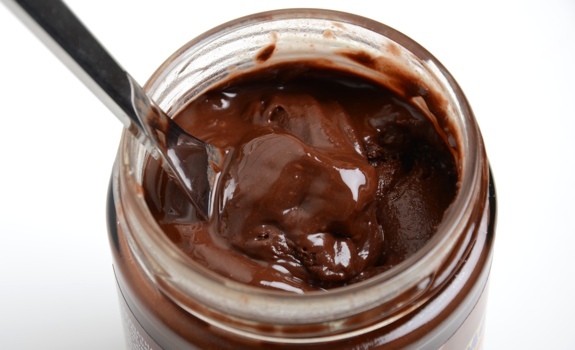 The spread itself is a dark, thick, shiny chocolate paste that could benefit from a bit of stirring once opened. The Taste: On toast, very nice. I expected something that tastes like Reese peanut butter cups, but that’s not what this tastes like. Think of it as Nutella made with peanuts instead of hazelnuts. It’s not salty like peanut butter, so what you taste is sweetness with cocoa and roasted peanuts. This would be a tasty filling in sweet crepes, especially paired with bananas and shredded coconut. Alternative Uses: On a slice of apple: OK. On a piece of warm buttered naan bread: Meh. Plain, licked from a spoon: Good. 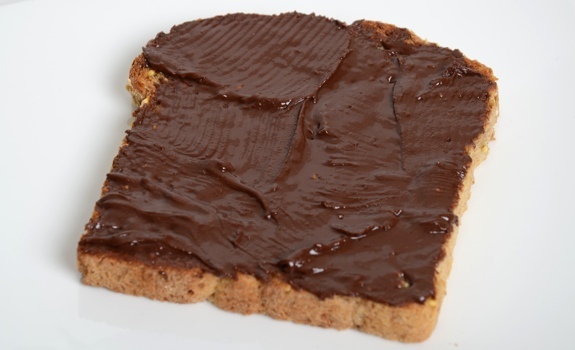 MaraNatha Dark Chocolate Peanut Spread on a slice of toast. I mean, who can stop spreading at just one tablespoon? Cost: $6.29 for a 368-gram glass jar at Planet Organic in Edmonton. Value for cash money: Not cheap. For the same price, I could buy a large tub of peanut butter elsewhere. Availability: Organic/health shops, health food aisles in grocery stores. The verdict: I like it more than Nutella, but that’s because I like peanuts more than hazelnuts. Good, yes, but I wouldn’t have it every day at breakfast. 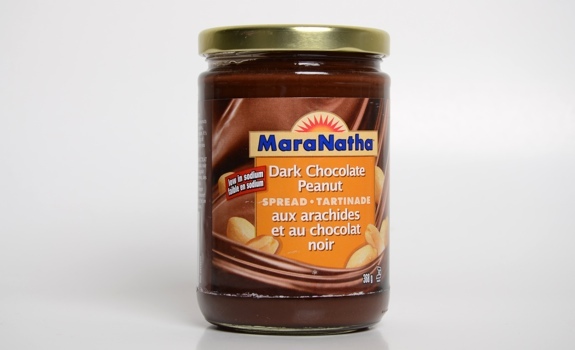 A cute little glass jar of MaraNatha Dark Chocolate Peanut Spread. im not sure if you have almost perfect in edmonton. but i found this stuff for $1.47 at one here in toronto!